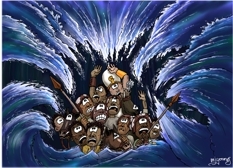 The water flowed back and covered the chariots and horsemen—the entire army of Pharaoh that had followed the Israelites into the sea. Not one of them survived. Verse 27 tells us that the scene is set at dawn, although, at this particular moment, you can’t see the sun, because of all the sea water! The lighting style is taken from the previous cartoons, but with slightly stronger, yellow/white sunlight beginning to permeate the sea water in this scene, resulting in stronger greens & lighter blues showing in it, rather than the cooler & deep blues that characterise the earlier scenes. I deliberately positioned the various Egyptian men in this scene to form a triangle of people & horses, with Pharaoh (the king of the Egyptians) at the top. Below him are various Egyptian charioteers & soldiers, with three horses. All are looking terrified by the walls of sea water about to engulf them. This scene uses all the colours & tones I’ve used in the previous scenes, to show the walls of sea water surrounding the Egyptian soldiers. I’ve added some more substantial greens into the sea water, rather than just keeping the blue hues. That reflects the fact that the sun is adding even more light (& hence colour) to the whole scene. I like the Message Bible version of that which reads: “First pride, then the crash— the bigger the ego, the harder the fall.” Pharaoh’s ego/pride certainly cost him & his entire army’s lives at this time.